The Emporium--"California's Largest, America's Grandest Store"--was a major shopping destination on San Francisco's Market Street for a century, from 1896 to 1996. Shoppers flocked to the mid-price store with its beautiful dome and bandstand. Patrons could find anything at the Emporium, from jewelry to stoves, and it was a meeting place for friends to enjoy tea while listening to the Emporium Orchestra. Founded as the Emporium and Golden Rule Bazaar, the store flourished until the disastrous 1906 earthquake. Once it reopened in 1908, it dominated shopping downtown until mid-century. Many San Franciscans remember with great nostalgia the Christmas Carnival on the roof, complete with slides, a skating rink, and a train. Santa always arrived in grand style with a big parade down Market Street. 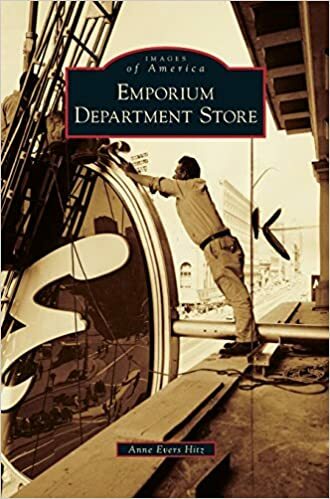 After World War II, the Emporium, which had merged with H.C. Capwell & Co. in the late 1920s, began its push and opened branch stores throughout the San Francisco Bay area. However, as competition increased, the company's financial situation worsened, and the Emporium name was no more in 1996.
draw, the branch stores also offered many activities. At the Stonestown store in 1956, the San Francisco Players Guild put on a performance of Puss in Boots. Seen here are the Enchanter and Lise, his servant. (Courtesy of the San Francisco History Center, San Francisco Public Library.) 120 This 1953 nighttime exposure of the lighted Ferris wheel at Christmas atop the Emporium makes it look like a giant target against the night sky. The other wheel is in the foreground, in motion but unlighted. in the State of California was shaken to the ground almost like a pack of cards.” The Parrott Building’s first and second floors, occupied by the Emporium, were intended to be fireproof. The floor arches were of hollow tile, and the columns were encased in the same material. Above the third floor (there were seven stories in front and five in the wings and rear), the floors and their supports, and most of the partitions, were of wood. The great quantities of flammable merchandise caught fire.